CarCaddy electric car pusher can push stalled vehicles weighing up to 50,000 lbs. Car manufacturing companies, dealerships, and service garages constantly need to move cars over short distances. In many situations, technicians might be required to manually push these cars especially when they are not in good working condition. CarCaddy electric car pusher provides a safe and effective alternative for dealing with this problem. It is a battery operated device that is capable of moving vehicles with pneumatic tires such as cars, trucks, and RVs and buses over short distances. CarCaddy takes the hard work out of moving cars in dealerships, warehouses, auto mechanic workshops, and other similar establishments. The CarCaddy pusher from DJ Products is designed to be the fastest, safest, and most convenient means around. It is battery-powered and capable of pushing cars up to 20,000 pounds on flat terrain. On terrains with 3% slope, it can handle as much as 10,000 pounds, more than twice the weight of the average car. There is even a heavy-duty motor/transaxle power upgrade that is capable of pushing trucks weighing up to 50,000 pounds. The CarCaddy is designed for long run times between charges. Investing in the equipment would be a smart decision for businesses that need to move vehicles within their premises, be it an automobile mechanic shop, a car dealership, or any other related establishment. 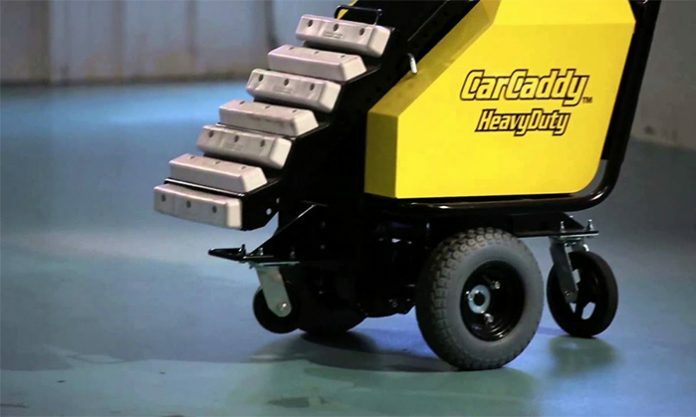 The CarCaddy would tremendously increase productivity while ensuring that employees do not experience the strain of pushing vehicles and heavy trucks. CarCaddy also reduces the demand for manpower. Normally, it could take up to five or more technicians to push a truck. With CarCaddy, just two persons can do the job effectively. CarCaddy operates in a tilting format that allows the adjustable pad to rest under a bumper or tow. The pad has been cushioned to ensure it is safe for all kinds of bumpers. In situations where access to the back of the vehicle is limited, you can still use the CarCaddy by attaching a tow to the front of the vehicle. The variable speed handlebar twist helps an operator to easily and slowly push the car in icy and wet conditions. CarCaddy travels at 0-3 miles per hour forwards or backward. CarCaddy is available for purchase on the DJ products official website. There’s also a wide range of vehicle pushers that are suitable for diverse applications.